September 21, 2014, marked two years of recovery from my accident. Looking back at my last major update, about a year ago, I see that, although the healing process continues, not a lot is changing on the surface. My appearance has improved a little more since my February surgery. The left eye now looks normal enough for people to feel comfortable asking why it’s so red—which the rim of the lower lid always is, to varying degrees. I don’t know if that will ever quite go away. My eye is still easily irritated, which can increase the redness. And it still waters a lot, as the cornea continues to dry out and overproduce tears. The eye still hurts at random moments, especially later in the day, sometimes sharply, sometimes deeply. The nerves in my cheek have almost fully regenerated. My eye crinkles almost normally when I smile. The central vision in my left eye is still gone, though I hold out hope for future medical developments that may reverse the damage (come on, stem cells!). In the meantime, I use my peripheral vision as much as I can to keep my optic nerve active: I sometimes walk around with my right eye shut just for the practice. I still forget sometimes why I can’t see clearly, especially when I first wake up. I have recently been experiencing a fresh bout of grief about the impairment of my sight. I still often bump into things on my left and lose my balance easily. I continue to have trouble concentrating and thinking clearly. I am still trying to figure out how to see as well as I can while I work; my vision varies a lot, and magnifiers and lights only help so far. I have not entirely recovered my turning skills. I got tendonitis in my right elbow (my dominant arm) in the spring and wasn’t able to work for several months. Add this to the many gaps in work caused by my surgeries and I guess my rustiness is understandable, if frustrating. It has been hard this time to get back into a creative flow, but I am working to hold a steady course through the latest challenges by remembering every day what I haven’t lost (family and friends, my sense of humor, my curiosity, a damn good life) and what I’ve gained (more love, gratitude, a greater sense of connectedness to everything). 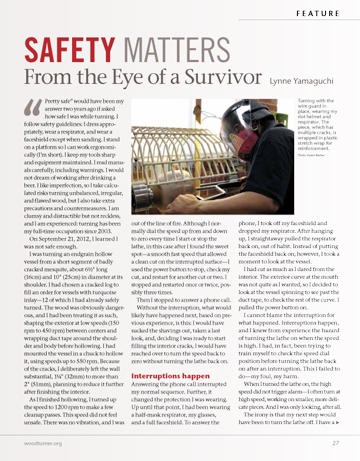 The June issue of American Woodturner featured “Safety Matters: From the Eye of a Survivor,” an article I wrote describing my accident and discussing some of what I learned afterward about protecting myself. Please feel free to share it with any woodturners you know; I am hoping that it will save others from injury. 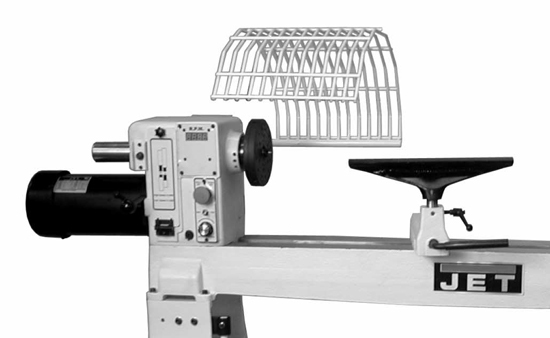 It was accompanied by this exercise for determining your own risk at the lathe, along with a table comparing risk values. So I should have (1) checked the position of the speed dial before restarting the lathe, (2) done a better job of wrapping the piece before beginning hollowing, and (3) put my faceshield back on, even if I was just looking. 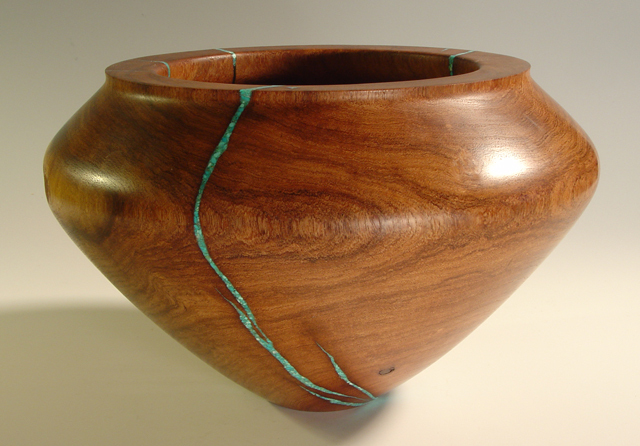 I was turning an end grain hollow vessel from a short segment of a badly cracked mesquite log. The final form at the time of the accident was about 10 inches in diameter at its shoulder and 6 1/2 inches tall. I knew it was a dangerous piece of wood from the beginning, and I had been treating it as such. The only reason I was turning such a dangerously cracked piece of wood was to fulfill a specific commission that called for a lot of stone inlay. I had turned down the exterior and shaped it between centers, including cutting a tenon to chuck it for hollowing, at speeds ranging from 150 to 450 rpm. I had wrapped the exterior with duct tape at the shoulder and along the taper before beginning to hollow. (With 20/20 hindsight, I would instead have swaddled the piece in plastic wrap.) I had hollowed the vessel at varying speeds up to 550 rpm. I had deliberately left the walls very thick, an inch and a quarter to more than two inches thick, out of caution because of the cracks. After hollowing about as much as I planned to, I turned up the speed to close to 1200 rpm to make a couple of clean-up passes on the interior. Note that when I was making these interior cuts at the high speed, I was positioned out of the line of fire, should the vessel have broken at that time. Although I normally dial my speed up from and down to zero, in this case, after I found a nice fast speed without vibration that allowed me a clean cut on the interrupted interior surface, I hit the power button to stop, check my cut, and restart for another cut or two. I stopped and restarted in this way once or twice, possibly three times. Then I stopped to answer a phone call. Without the interruption, what would likely have happened next, based on previous practice, is this: I would have felt the interior surface, sucked the shavings out, taken a last look, and, deciding to call it quits on the interior, I would have reached over at that point to turn the speed dial back to zero without turning the lathe back on. That would have completed the rhythm of that sequence. Answering the phone call interrupted that sequence. Further, it changed the protection I was wearing. Up until that point, I had been wearing my half-mask respirator, my glasses, and a full faceshield. I took off my faceshield and dropped my respirator to answer the phone. After hanging up, I pulled the respirator right back up, out of habit. Instead of putting the faceshield back on, however, I used the opportunity to take a careful look at the vessel. I had cut as much as I dared from the interior. I saw that the exterior curve near the mouth wasn’t quite what I wanted. I repositioned the tool rest from inside the vessel to parallel to the top, and I pulled the power button on. I wanted to look at the vessel spinning so that I could see beyond the duct tape to see if I wanted to make any other cuts before calling it quits for that stage of the turning. Now, despite what I just implied a couple of paragraphs back, I can’t really blame the interruption for what happened. Interruptions happen, and I knew from previous experiences the danger of turning on the lathe when it is already set at a high speed. I have in fact been trying to train myself to habitually and automatically check the relative position of the speed dial before turning the lathe back on after any interruption. This I plainly failed to do, and I have to take full responsibility for my failure to do so. When I did turn the lathe on, the high speed didn’t trigger any alarms for me. 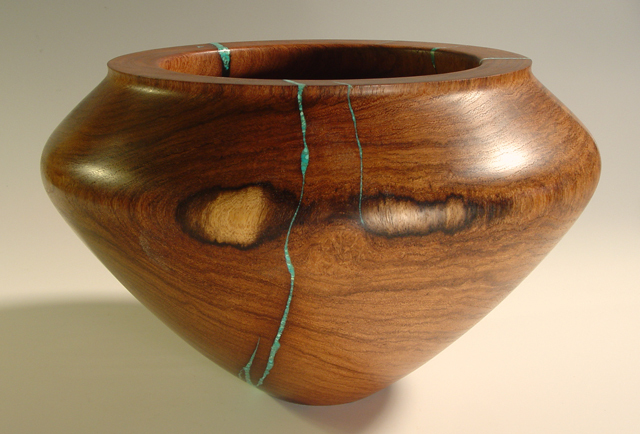 I often turn at high speed, because I normally turn much smaller, more delicate pieces, often with interrupted surfaces. And I was only looking, after all. 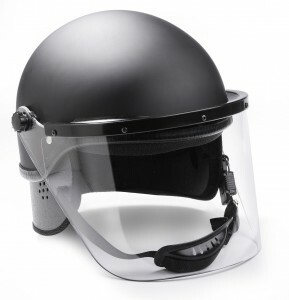 I confess I always thought of faceshields as protecting my eyes from flying chips, not as protecting my head and face from random missiles. The irony is that my next step would have been to turn the lathe off. I have a clear image of the piece as I was last seeing it. I couldn’t have touched up the surface I was dissatisfied with even if I had wanted to: the duct tape was in the way. I would have turned off the lathe and waited till a later stage to touch up that curve. Although I had a tool in my hands, it wouldn’t have been the appropriate tool for such touchup, and I didn’t have it raised for use. If I had, my forearm might have provided some defense. As it was, I was just looking. I may have even been leaning in to look. It was a peaceful, unthreatening, undangerous moment.